If you’ve ever traveled to the East, you’ve likely come across turmeric, a vivid gold-yellow root that has long been lauded for its miraculous health benefits. An essential in Ayurvedic and Chinese healing philosophies, this vibrantly-hued relative of ginger is quickly becoming a staple of diets around the world. Golden milk and turmeric lattes are now popping up on menus in cafes from Berlin to Los Angeles and in health-savvy cities in between. And with the myriad health benefits, it’s no wonder! Turmeric has been used to reduce inflammation, prevent or slow the progression of Alzheimer’s disease, act as a natural painkiller, ease depression and disinfect and speed wound healing time. This wonder spice is a must for a lifestyle of wellbeing and happiness. Here’s how you can effortlessly incorporate turmeric into your life–and a delicious recipe to try today! 6 Simple ways to incorporate Turmeric into your daily routine. Use turmeric to flavor eggs, cooked veggies, and meat dishes. Add it to the water you’re boiling for quinoa, rice and pasta. In addition to the lovely color it will infuse into your food, you’ll tap into the benefits with every bite! Make a new kind of tea. Take relaxation to a whole other level. 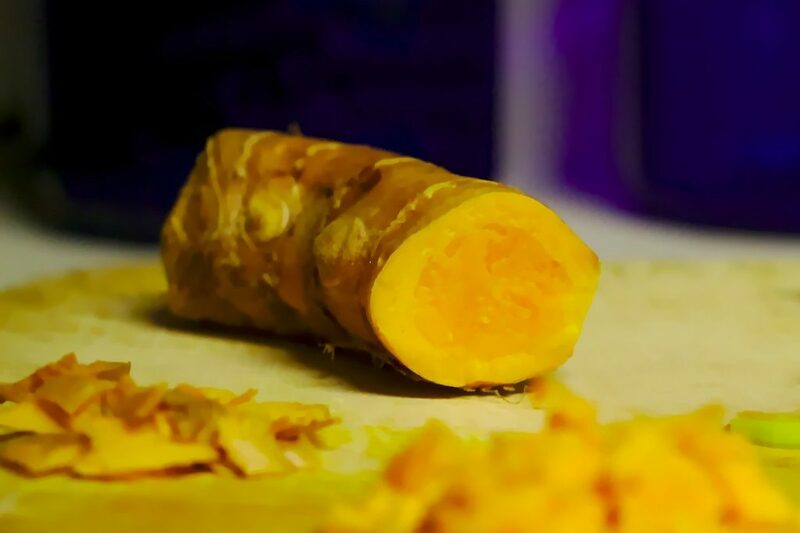 Bring four cups of water to a boil and stir in one teaspoon of ground turmeric. Reduce to a simmer for 10 minutes. Use a fine sieve to strain the tea into a cup, and then add honey and/or lemon to taste. Relax and rejuvenate your body and mind. Sometimes it’s difficult to control when and how you eat. But regardless of travel or daily disruptions to routine, your wellness doesn’t have to suffer. A daily turmeric supplement can provide you with the benefits in an easy, on-the-go kind of way. Cleanse your body of toxins that drag you down. Combining castor oil with turmeric powder can provide a powerful detox for your skin and lymphatic system. Apply it to your underarms to draw out harmful toxins that become lodged in your lymph nodes and fatty cells. Add it to your beauty regimen. The powerful root packs a plethora of skin-boosting nutrients due to its extraordinarily anti-inflammatory, anti-septic, antibacterial and anti-aging properties. Used for centuries in Ayurvedic beauty, turmeric can be combined with a few simple ingredients for an excellent DIY face mask. Wash face with warm water (opens pores). Pat dry. Mix the ingredients completely in a bowl. Using clean fingertips to apply a thin layer of the mask to your face. Take care to avoid your eyes, eyebrows and mouth. Leave on for 10-15 minutes, or until completely dry. Use a washcloth to remove mask, then apply a light moisturizer. Your physical, mental and emotional wellbeing are all interconnected. When you take the time to incorporate simple, natural elements into your diet and routine, you can reap the happiness rewards daily, and long into the future. For more tips and rituals for tapping into your happiest self, check out our detox challenge.